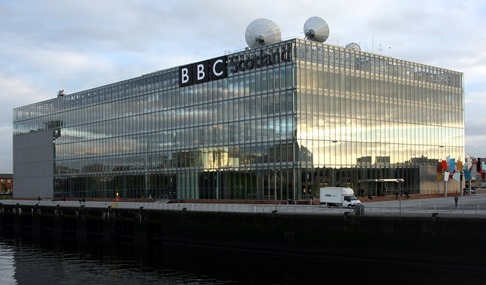 Accompanying image shows the headquarters of BBC Scotland at Pacific Quay on the River Clyde. Glasgow, Scotland, June 18, 2018 – ATG Danmon reports the completion of a systems integration project for BBC Scotland. The project centred on the modernisation of a compact television gallery assigned to the production of bulletin-style news programmes. "Careful co-ordination was vital to ensure the daily broadcast schedule could continue as normal," comments ATG Danmon project manager Howard Dixon. "This was achieved by installing all the required new equipment in a temporary control room which could be fully configured and used for staff training before going live. Once that was fully operational, we decommissioned and emptied the legacy control room before moving the complete system in. "We achieved the switchover with complete success in little more than half a day. The infrastructure includes new VizRT Mosart control and playout automation, a large Adder Link Infinity KVM system, a Media Wall multiscreen display using Sony 55 inch 4K monitor screens, and J.L. Cooper audio fader control. "We also designed and integrated a large Custom Consoles L-shaped control desk to fit the available space. This is configured for use by up to a five-strong team comprising news editor, teleprompter, producer, director and technical operator." Based in Glasgow, BBC Scotland (www.bbc.co.uk/scotland) currently transmits three TV channels (BBC One Scotland, BBC Two Scotland, BBC Alba) and two radio stations (BBC Radio Scotland and BBC Radio nan Gàidheal). It currently produces approximately 15,000 hours of television and radio programming per year. Part of the Danmon Group (www.danmon.com), ATG Danmon has been at the forefront of the transition to the file-based technology now used throughout the industry. It has also assisted many clients in the construction of IT-based automated file workflow systems, high-definition studios, master control rooms and playout facilities, as well as the upgrade of existing SD systems to HD and UHD. By embracing tomorrow's technology, ATG Danmon delivers maximum value through close co-operation with suppliers and customers, leading to mutually beneficial long-term relationships.